Nice guy Microsoft isn’t one to troll its rivals. It’s not going to blatantly take down Apple in the same way Google does. Neither is it going to start a social media war à la Wendy’s. Instead, in a very bizarre fashion, the tech giant has decided to diss its prized Office suite against the ‘Office 365’ subscription service. A new series of commercials has twins competing to complete tasks, with one being handed the ‘Office 2019’ software and the other using ‘Office 365’. Each time, the cloud-based app beats the classic version. 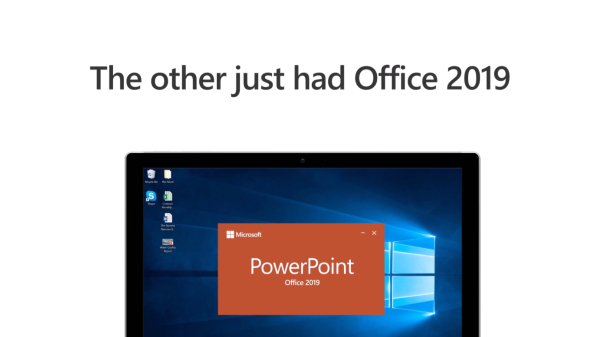 While uncharacteristic, the reason ‘Office 2019’ gets depicted as the inferior suite is simple: it’s downloadable through a one-time fee of US$250. On the other hand, ‘Office 365’—which comes with online, AI-driven features—is subscription-based with prices starting from US$70 for personal use and US$8.25 per month for commercial use. Watch the ads below, where twins challenge each other using Microsoft Powerpoint, Excel, and Word.